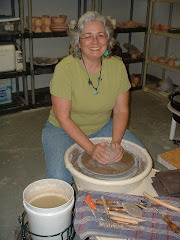 I am a ceramic artist making functional and decorative pottery. Nature is the inspiration for my work. Themes of leaves, flowers and branches weave their way into cups and bowls, plates and vases. Carved images and textured patterns echo leaf veins and vines, the striations of bark, etc. and offer a palpable, tactile experience to a user, which is as important to me as the visual images. I create my own glazes to compliment the textures of the pieces and layer them one over another subtly. I strive for complex and varied color and achieve this by continually experimenting with my glaze palette. Clay is my chosen medium because of it's history, it's permanence, it's three dimensionality and it's unpredictability. I know that even as I strive to place limits on how the clay and glazes will react, there will always be an unknown element when the firing is complete. For me the unpredictability is the adventure and the transformation is the magic.